Red Sox minor leaguer Cody Kukuk was one of five men who were arrested in connection with a reported home invasion in Lawrence, Kansas, which took place on November 8. According to WOW! 6 out of Lawrence, Kukuk was arrested on Monday in California, and he will appear in court early Thursday morning before potentially being extradited to Kansas. Police say that the suspects were armed—one with a gun, the others with objects—and wearing masks when they broke into the home. They allegedly battered the victims and took off with some cash and electronics. This is not Kukuk's first run-in with the law. He was arrested for driving under the influence in May 2012, but those charges were later dropped after it was determined that the officer did not have probable cause to search his vehicle. 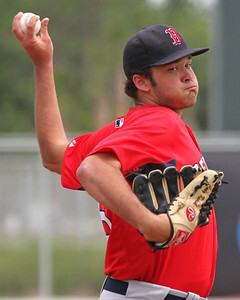 Drafted in the seventh round of the 2011 draft and currently ranked as the 43rd best prospect in the system, Kukuk's future with the Red Sox organization is now in question at best. He was projected to begin next year in Salem, where he ended last season with a 5.26 ERA in 78 2/3 innings, striking out 87, but walking 71. If convicted, Kukuk could face up to 20 years in prison.